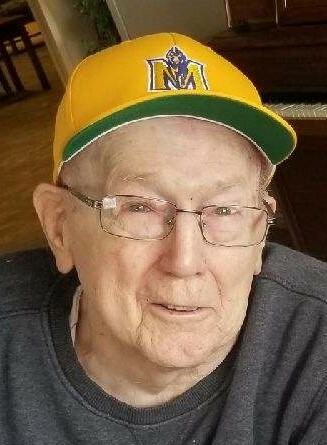 Bernard F. “Bernie” Behrendt, 88, of Symsonia passed away on Friday, July 27, 2018 at his daughter’s residence. Mr. Behrendt was born on April 26, 1930 in Chicago, IL. He moved to Western KY on a football scholarship to Murray State University. There he met Margie Blondell Roberts and they were married on February 17, 1952. He never returned to Chicago except to visit. His passion was being an educator, coaching, and entertaining his grandchildren. He also enjoyed playing duplicate bridge. He taught and coached at Crittenden County, Metropolis High School, and Reidland High School. He was also principal of Lone Oak High School. He loved his ex-players. He was of the Catholic faith. He is survived by his wife, Margie Behrendt; two children, Arletta (Roger Rives) Kennedy and B.F. (Lisa) Behrendt Jr.; two grandchildren, Brian (Leslie) Behrendt and Lindsey (Adam) Hill; and four great-grandchildren. He was preceded in death by one grandchild, Allison Behrendt; and four siblings. His parents were Joe Behrendt and Genevieve Kraus. Friends may visit the family from 5:00pm to 8:00pm on Monday, July 30, 2018 at Lindsey Funeral Home. Private entombment will take place at Woodlawn Memorial Gardens. Memorial contributions may be made in his honor to the Alzheimer’s Association at 225 N Michigan Ave. Floor 17 Chicago, IL 60601 or to the American Lung Association at 1200 Hosford Street Suite 101 Hudson, WI 54016.